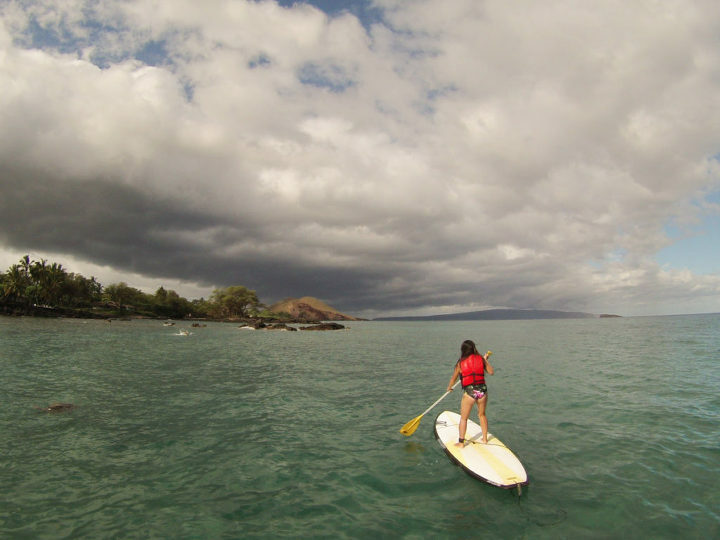 Stand up paddle (SUP) boarding in Hawaii has been on my must do list for many, many years. Even though I can’t swim, am scared of being in the ocean, and know I’ll fall many times during the lesson, I still wanted to scratch it off my bucket list. 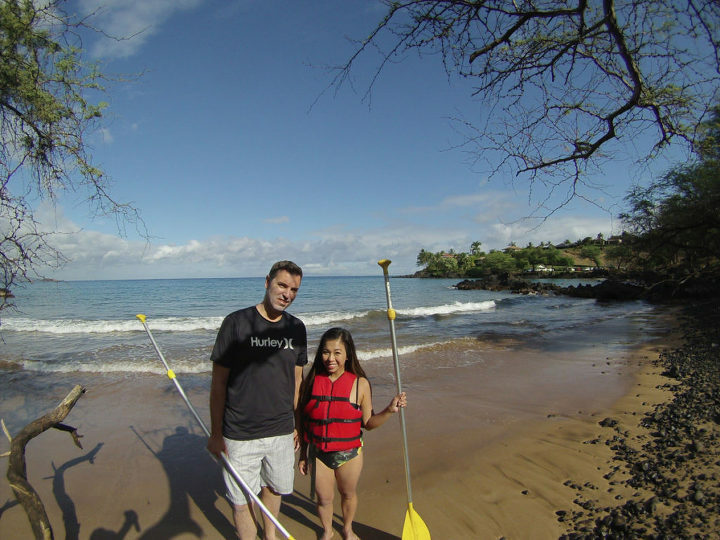 We decided to do private lessons with Hawaiian Paddle Sports because of my fear and felt like I needed that one-on-one extra attention versus getting lessons in a group setting and be lost in the crowd. When we met with our guide, Laurie, she first talked about the company and their environmental responsibility. She talked about how everyone in the company has a responsibility (kuleana) to keep the marine life safe and clean for the beautiful sea creatures. I love how they love their island so much they make financial contributions to non-profit groups and organizations. Not only do they make financial donations, every team member volunteers their time monthly to organizations in Maui as well. What a team! After a few pictures taken by Laurie with her GoPro camera, we were off for our lesson at sea. I fell almost immediately. I thought for sure I was doomed for failure after that. Laurie was very patient and was always near to guide us back on our paddle board. Surprisingly, I only fell a total of four times! Same with the Giant. I kinda felt like once you got those initial falls out of the way, you’re all good and will be paddling like a pro. At one point I got too close to the lava rocks and thought for sure I was going to crash into it. 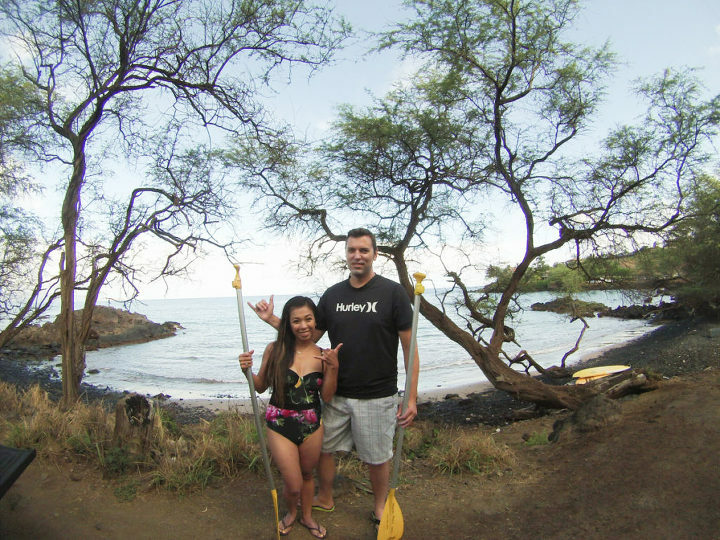 Shockingly, I remained calm and floated away by pushing onto the rocks with my paddle. I was so proud of myself for that! The water is a little more calm on that side of Maui during the morning hours. With minimal swell, and mostly sunny skies, we were able to see several feet down in the crystal blue water. Laurie guided us to an area where turtles tend to hang out. Sure enough, several large green sea turtles playfully swam beneath our boards! When we were ready to head back in, Laurie also assisted with getting us OUT of the water, and carrying our boards back up the beach so we didn’t have to contend with the waves. That was a huge help for a non-swimmer. If you’re an inexperienced swimmer like me and you’re not comfortable in the ocean, having private lessons is a definite MUST. Laurie made this nerve wracking day so much more fun and relaxing.